Robert Hight (Funny Car), Jeg Coughlin Jr. (Pro Stock) and LE Tonglet (Pro Stock Motorcycle) also emerged as winners in their respective categories at the 15th of 24 events on the 2018 NHRA Mello Yello Drag Racing Series schedule. The race also was Round 2 of three events comprising NHRA’s annual summertime Western Swing. Alexander powered to the winner’s circle with a 1,000-foot run of 4.004-seconds at 287.41 mph to take down the winningest driver in Top Fuel history, Tony Schumacher. 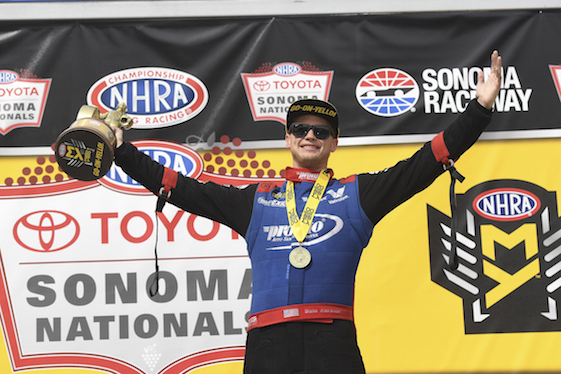 Despite having competed at only six events this season, Alexander now has three final -round appearances as one of four Top Fuel competitors with multiple wins in 2018. Alexander eliminated fellow-Californian Mike Salinas, three-time world champion Antron Brown and Scott Palmer as he continues to make a bid to qualify for the six-race Countdown to the Championship playoffs. An eight-time world champion, Schumacher’s third runner-up finish of the season moved “The Sarge” into second in the standings in his bid to close the gap to leader Steve Torrence. Schumacher, of Don Schumacher Racing, also was one of four Top Fuel competitors to join Torrence by clinching a position in the Countdown, as he, Clay Millican, Doug Kalitta and Leah Pritchett fill out the first portion of 10 available spots. Hight, the two-time/reigning world champion from John Force Racing, covered the 1,000-foot distance in 3.984-seconds at 319.75 mph to beat DSR’s Ron Capps in the final. Hight secured his second win of the season and the second of his career at Sonoma. Hight qualified 11th and defeated Tim Wilkerson, Bob Tasca III and Tommy Johnson Jr. on his path to victory as he locked in his position in the Countdown. Capps, the 2016 world champ and driver of his Dodge Charger R/T, now has two runnerup results in three final rounds this year. Capps and DSR teammate/two-time world champ Matt Hagan joined Courtney Force by locking into the Countdown. Coughlin covered the traditional quarter-mile in 6.532-seconds at 212.16 mph to defeat Deric Kramer in the final to become the second Pro Stock driver with three victories this season. A five-time world champion, Jeggie secured his third career win in Sonoma and first since 2010. Coughlin defeated Alex Laughlin, Tanner Gray and No. 1 qualifier/four-time world champ Greg Anderson before locking down the win. Despite falling in the semifinals to Coughlin by 0.0018-seconds, Anderson became the first driver in the “Factory Hot Rod” class to clinch a spot in the Countdown. Tonglet brought home the win in Pro Stock Motorcycle after covering the quarter-mile in 6.771-seconds at 198.52 mph aboard his Nitro Fish Racing Suzuki to eliminate point-leader Andrew Hines in the final. The 2010 world champion, Tonglet notched his third consecutive victory at Sonoma Raceway as he now has two wins this season. “We got lucky in the first round because I had a terrible light, but once we got that round win we just kept rolling and turning on win lights,” Tonglet said. “We came off the trailer going fast this weekend and that kept going with each round, so that made today a great day.” Tonglet trailered Cory Reed, Joey Gladstone and No. 1 qualifier/four-time world champ Eddie Krawiec en route to victory. Hines, a five-time world champ, now has four runnerup finishes aboard his Screamin’ Eagle Vance & Hines Harley-Davidson Street Rod. The current point-leader, Hines will look for his first win in 2018 when Pro Stock Bike returns to the circuit at Brainerd, Minn.
Five Pro Stock Motorcycle riders have clinched a spot in the Coutndown _ Hines, Krawiec, Tonglet, Hector Arana Jr. and 2016 world champion Jerry Savoie. The Western Swing will conclude at Pacific Raceways in Kent, Wash., near Seattle, from Aug. 3-5. Top Fuel _1. Blake Alexander; 2. Tony Schumacher; 3. Doug Kalitta; 4. Scott Palmer; 5. Antron Brown; 6. Bill Litton; 7. Brittany Force; 8. Clay Millican; 9. Richie Crampton; 10. Steve Torrence; 11. Jim Maroney; 12. Terry McMillen; 13. Shawn Reed; 14. Leah Pritchett; 15. Mike Salinas. Funny Car _ 1. Robert Hight; 2. Ron Capps; 3. Tommy Johnson Jr.; 4. John Force; 5. Jack Beckman; 6. Del Worsham; 7. Matt Hagan; 8. Bob Tasca III; 9. Shawn Langdon; 10. Tim Wilkerson; 11. Jonnie Lindberg; 12. Courtney Force; 13. Cruz Pedregon; 14. Jim Campbell; 15. J.R. Todd; 16. Richard Townsend. Pro Stock _1. Jeg Coughlin Jr.; 2. Deric Kramer; 3. Jason Line; 4. Greg Anderson; 5. Tanner Gray; 6. Erica Enders; 7. Alex Laughlin; 8. Drew Skillman; 9. Vincent Nobile; 10. Chris McGaha; 11. Fernando Cuadra; 12. Steve Graham; 13. Alan Prusiensky; 14. Matt Hartford; 15. Bo Butner; 16. Joey Grose. Pro Stock Motorcycle _1. LE Tonglet; 2. Andrew Hines; 3. Eddie Krawiec; 4. Jim Underdahl; 5. Joey Gladstone; 6. Jerry Savoie; 7. Hector Arana Jr.; 8. Matt Smith; 9. Hector Arana; 10. Steve Johnson; 11. Angie Smith; 12. Ryan Oehler; 13. Angelle Sampey; 14. Cory Reed; 15. Karen Stoffer; 16. Scotty Pollacheck. Top Fuel _Blake Alexander, 4.004-seconds, 287.41 mph def. Tony Schumacher, 4.345-seconds, 219.65 mph. Funny Car _ Robert Hight, Chevy Camaro, 3.984, 319.75 def. Ron Capps, Dodge Charger, 4.077, 296.11. Pro Stock _ Jeg Coughlin Jr., Chevy Camaro, 6.532, 212.16 def. Deric Kramer, Camaro, 6.534, 210.54. Pro Stock Motorcycle _ LE Tonglet, Suzuki, 6.771, 198.52 def. Andrew Hines, Harley-Davidson, 6.802, 197.48. Super Stock _ Don Keen, Ford Mustang, 10.315, 127.86 def. Mark Kirby, Plymouth Duster, 10.242, 126.07. Stock Eliminator _ Leo Glasbrenner, Pontiac Firebird, 10.595, 120.23 def. Jody Lang, Chevy Malibu, 12.224, 97.68. Super Comp _ Robert Naber, Dragster, 8.911, 177.84 def. Matt Woodard, Dragster, 8.920, 175.43. Super Gas _ Matt Blodgett, Chevy Nova, 9.908, 141.50 def. Ron Mackenzie, Chevy Corvette, Foul/Red Light. Top Dragster presented by RacingRVs.com _ John Richardson, Dragster, 28.098, 192.66 def. Andy Spiegel, Dragster, Foul/Red Light. Top Sportsman presented by RacingRVs.com _ Ken Ratzloff, Studebaker, 7.230, 191.35 def. Ted Kellner, Pontiac Firebird, 7.314, 187.29. FINAL _ Alexander, 4.004, 287.41 def. Schumacher, 4.345, 219.65. FINAL _ Hight, 3.984, 319.75 def. Capps, 4.077, 296.11. FINAL _ Coughlin, 6.532, 212.16 def. Kramer, 6.534, 210.54. FINAL _ Tonglet, 6.771, 198.52 def. Hines, 6.802, 197.48. Top Fuel _1. Steve Torrence, 1,168*; 2. Tony Schumacher, 1,031*; 3. Clay Millican, 1,025*; 4. Leah Pritchett, 989*; 5. Doug Kalitta, 951*; 6. Antron Brown, 809; 7. Terry McMillen, 728; 8. Brittany Force, 697; 9. Scott Palmer, 617; 10. Richie Crampton, 608. Funny Car _1. Courtney Force, 1,197*; 2. Ron Capps, 1,032*; 3. Robert Hight, 1,024*; 4. Matt Hagan, 1,001*; 5. Jack Beckman, 967; 6. J.R. Todd, 863; 7. Tommy Johnson Jr., 819; 8. John Force, 807; 9. Shawn Langdon, 680; 10. Bob Tasca III, 656. Pro Stock _1. Greg Anderson, 1,126*; 2. Tanner Gray, 1,031; 3. Erica Enders, 1,023; 4. Vincent Nobile, 979; 5. Jeg Coughlin Jr., 956; 6. Chris McGaha, 907; 7. Drew Skillman, 895; 8. Jason Line, 857; 9. Deric Kramer, 828; 10. Bo Butner, 822. Pro Stock Motorcycle _1. Andrew Hines, 687*; 2. Eddie Krawiec, 651*; 3. LE Tonglet, 609*; 4. Hector Arana Jr., 562*; 5. Jerry Savoie, 534*; 6. Matt Smith, 473; 7. Scotty Pollacheck, 449; 8. Angie Smith, 336; 9. Hector Arana, 321; 10. Angelle Sampey, 320. Note _ *Denotes clinched a spot among the top-10 for the Countdown to the Championship playoffs.